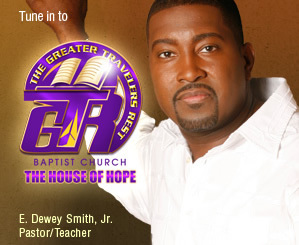 Pastor/Teacher E. Dewey Smith, Jr.
“About the Bible: We believe that the Bible is God’s Word. As such, it is true without any mixture of error and is the supreme standard by which all human conduct, creeds, and opinions should be tried. The service times for GTRBC have changed. There 12:15 service has been combined with the 10a service.